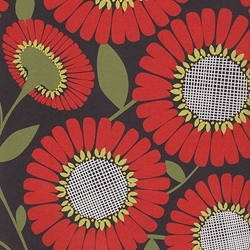 Daisy Persimmon - Large, persimmon red daisies cover this sheet; against a black background. The dark backing makes the red seem to vibrate! Great for scrapbooking, bookmaking, collage, and for use as a finished work of art (simply frame a sheet!). Sheets measure 19x26 inches. Printed on 100% recycled, 30% PCW paper. Made and designed in the USA.